King Pig thinks he can make the sheep do whatever he wants, but he can’t make them like him. He doesn’t understand it. Why don’t the sheep adore him like they should? The bossy King thinks he is doing everything he should to endear himself to his subjects, but when a small voice suggests that he should try being nice, he has to rethink his attitude. King Pig is a combination of entertaining text, amusing illustrations and a gentle reminder for readers that it is important to be kind. Nick Bland’s illustrations will appeal to children and adults. I love the expressions on the faces of the sheep as they undertake the tasks the King gives them or, if possible, simply ignore his blustering and bossiness. 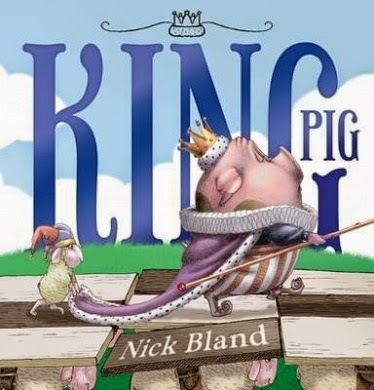 King Pig is another wonderful story from favourite author/illustrator Nick Bland. His gentle message for readers will be so much more effective and meaningful because he presents it in such an entertaining and humorous way.